Hohenschwangau castle overlooks the village of the same name on the shore of the idyllic Alpsee. Located close to Füssen in the south of Bavaria, Hohenschwangau (a district of Schwangau) is the place to stay when you visit the royal castles of King Ludwig II. The castle of Hohenschwangau was rebuilt and designed by Ludwig's father Maximillian II, it replaced an old ruin in a wonderful location. Although it seems that Hohenschwangau is put in the shade of the more famous Neuenschwanstein, it is worth to set some time aside to visit this castle as well. 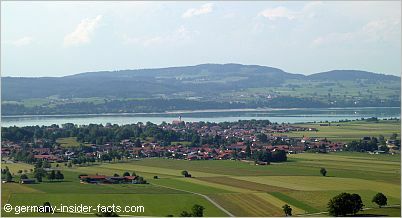 Actually, I know quite a few people who say that they love Hohenschwangau better! The area around Schwangau and Fussen is called Königswinkel (king's nook), and Schwangau is also the second-last and Füssen the final town on the southern end of the romantic road. Come and explore Germany's fairy-tale world, I am sure you will enjoy it. The castle was first mentioned in the 12th century. 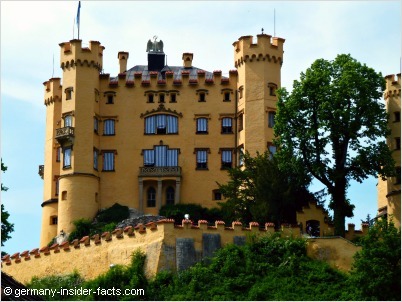 The knights of Schwangau owned the castle for about 400 years. Damaged in wars, the castle decayed and was described as useless for defense purposes. 1832 Crown Prince Maximillian fell in love with the idyllic location and bought the ruin. From 1833 the castle was reconstructed in neogothic style, following original plans. 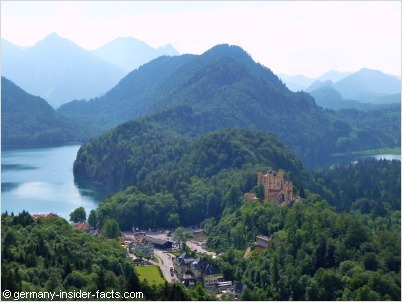 Hohenschwangau became the summer residence of the royal family, the place where Ludwig II spent much of his childhood. See the beautiful original interior decoration in several rooms during the castle tour. The largest room is the Hall of Heroes and Knights that takes up the width of the castle. The Queen's bedroom shows an oriental style while the men's bedroom (first Maximillian II later Ludwig II) is beaufully painted with themes from Torquato Tasso's poem "Jerusalem Delivered". Like Neuschwanstein, you can only visit Hohenschwangau castle on a guided tour, operated by castle staff. The ticket centre in Hohenschwangau is the place to buy tickets. Want to avoid the lines? Take the opportunity to get your ticket online on their website for a small reservation fee.. I suppose you want to visit Neuschwanstein castle as well? Find more info about tickets to visit both palaces on my Neuschwanstein tours page. You are not allowed to take photos inside the castle. 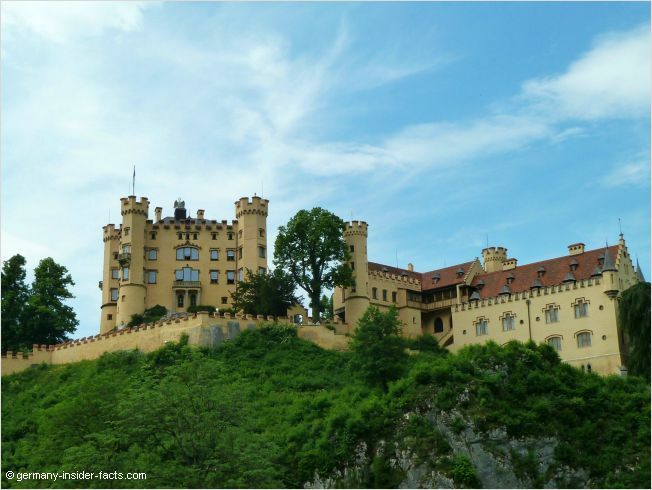 During the tour of Hohenschwangau castle you have to climb a couple of stairs, but not as many as in Neuschwanstein..
On the first day you are going to see Linderhof Castle and Oberammergau before you proceed to Hohenschwangau and a tour of Neuenschwanstein. 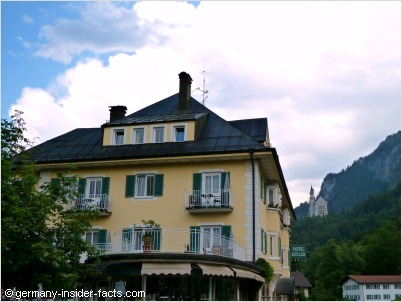 Stay overnight at Hohenschwangau and enjoy a tour of this castle the next morning. The afternoon is free. Walk to Alpsee or Schwanensee, or relax in a lovely cafe in Hohenschwangau. The coach takes you back to Munich where you arrive at approximately 7 pm. Tour price is 219 € and includes transport by air-conditioned coach, overnight accommodation and breakfast. Located in the Allgäu, a favourite holiday region in Germany, Schwangau and Hohenschwangau offer much more to visitors than the castles. Take the Tegelberg mountain cable car to enjoy breathtaking views from an altitude of 1720m (5643ft). Relax in the panorama cafe, watch the hang gliders and paragliders, take a tandem flight if you are daring ennough. Snowboarding and skiing is possible in the Tegelberg ski resort during winter. The kids will love the summer luge and the giant playground that offers a lot of fun and action. The Royal Crystal Spa in Schwangau offers saunas, steam baths, a gem stone meditation cave and an outdoor pool. The area invites for hiking and biking in the lovely scenery. While Hohenschwangau is a very busy place during the day, it falls quickly asleep once the day tourists have left. Smaller hotels and guesthouses don't have their own restaurants, a fact you should take into account, especially when you don't have your own car. When you have some time it is really worth to stay a day or two in Hohenschwangau to explore the lovely surroundings. 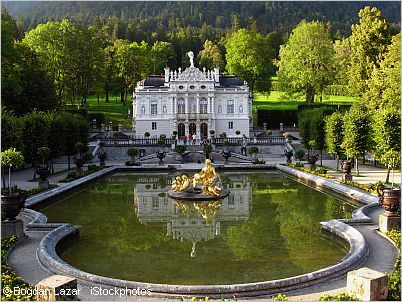 Discover why Ludwig II was fascinated by this area in southern Bavaria. Hotels are nice and comfortable and offer great country hospitality. Use the search box to find a hotel in Hohenschwangau, Schwangau, or Füssen. These towns are convenient to stay when you want to visit the royal castles.